STURDY AND COMFORTABLE: A water-resistant shower chair with non-slip sponge padding on the seat and back for added comfort and safety. Seat supports up to 250 pounds. 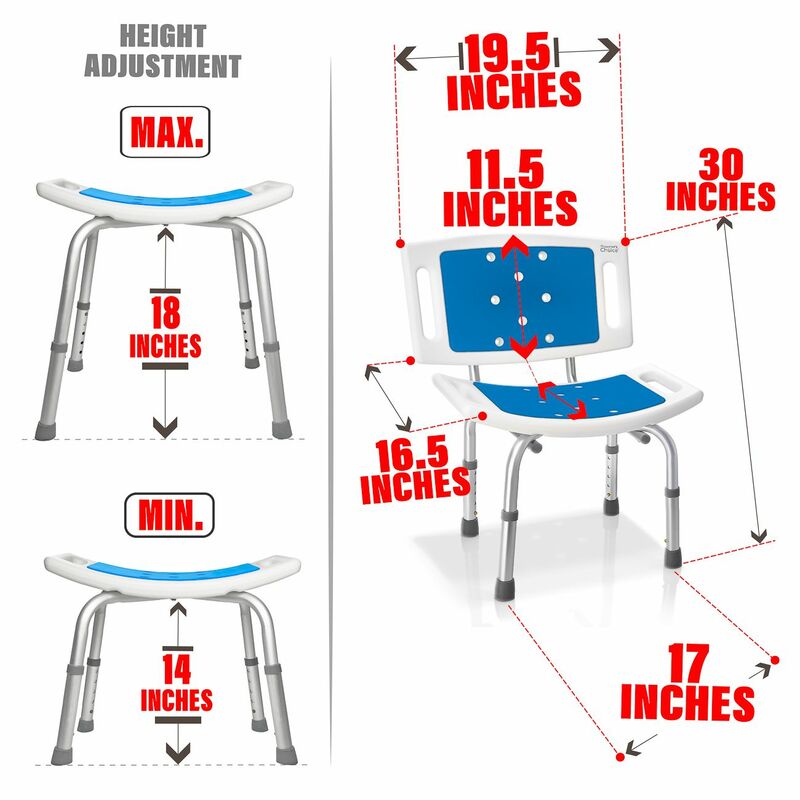 HEIGHT ADJUSTABLE: Seat adjusted from 14” to 18” with legs that slide up and down and lock into place to accommodate tall or small users. 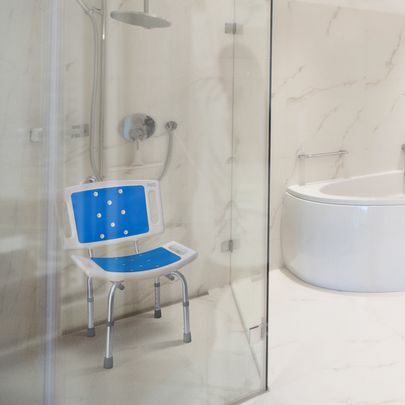 WILL NOT RUST OR CORRODE: Made of fully aluminum legs and industrial-grade plastic construction that will not stain or rust tubs or showers. 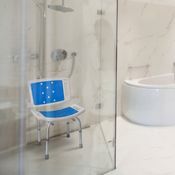 LIGHT WEIGHT: Weighs less than eight pounds for easy lifting in and out of shower or bathing areas. 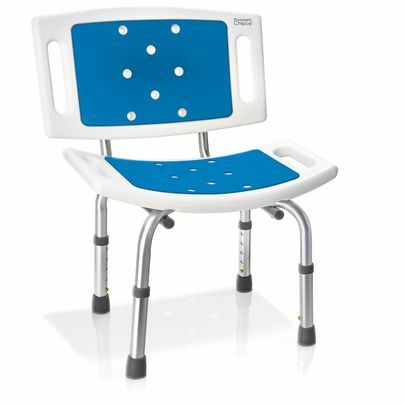 Unlike permanently mounted seats with heavy hardware, this can be easily moved around the house. 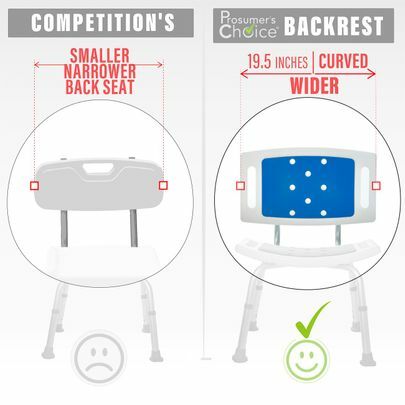 EXTRA-WIDE AND PADDED BACK REST: Designed for extra comfort, includes an extra-broad 19” padded backrest. Also includes built-in drain holes for faster drying and ventilation. Young or old we all enjoy a hot shower, but who wants to stand when you can sit in comfort instead? 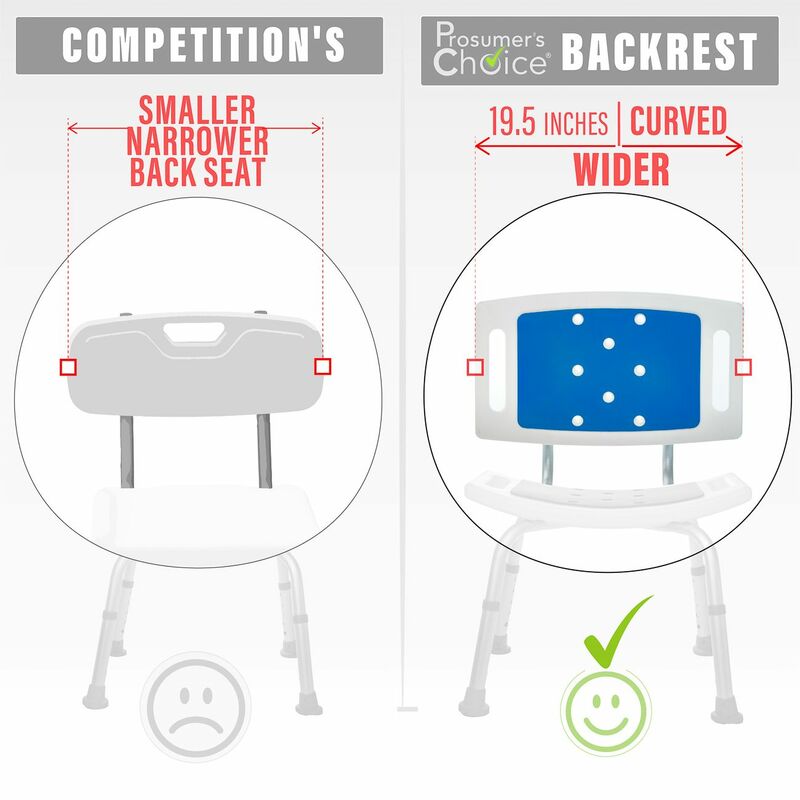 Prosumer’s Choice presents a water-resistant bath chair designed with easy-to-place non-skid feet and sponge padding on its surfaces for added comfort. Capable of supporting up to 250 pounds, this bathroom accessory is sturdy yet lightweight at less than eight pounds, so you can place it anywhere you need it. With all-aluminum legs that won’t rust or stain tubs, this adjustable device will accommodate tall or tiny builds. Each Leg has adjustable elevation with five different heights that lock into place. Slippery or wet floors can be a constant worry for seniors and their caregivers or anyone recovering from injury. 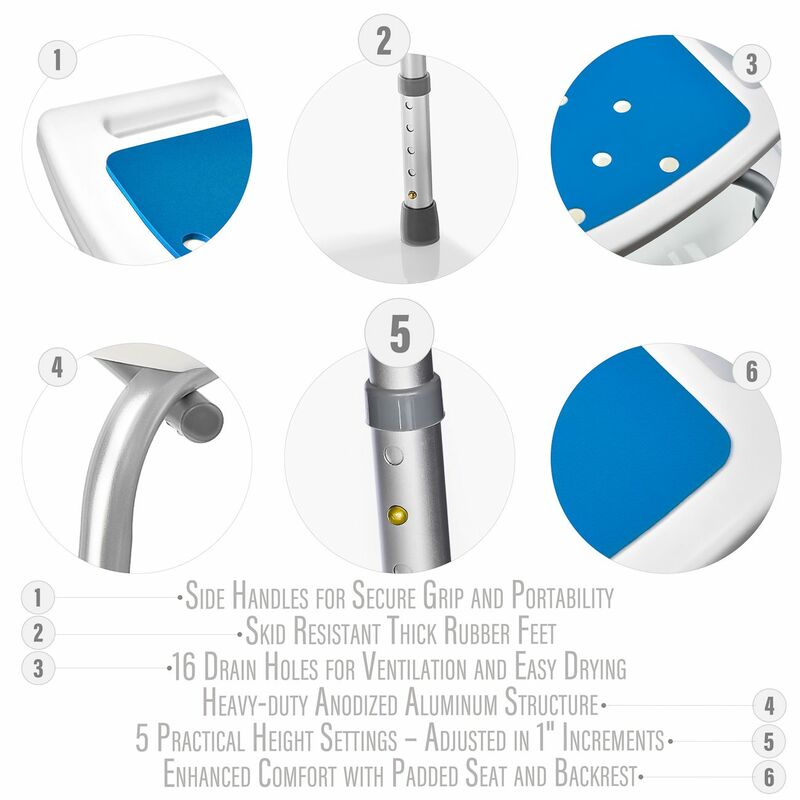 Whether you’re a senior or someone recovering from a sports injury, this effective essential device will augment your comfort and sense of independence. In addition to aiding your sitting experience, its padded surfaces are designed to support your muscles and relieve pressure or discomfort from sitting for long hours. 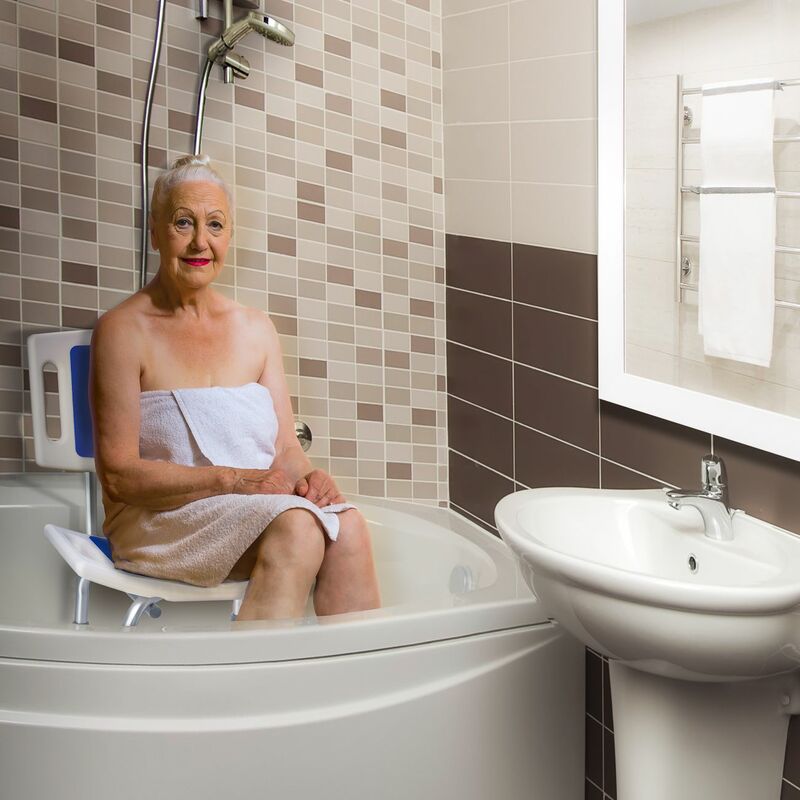 Easy to assemble and easier to clean, your new accessory will fit in any bathing area. Its rubber feet are slip resistant, ensuring your device has a better grip and firmer footing on wet surfaces. 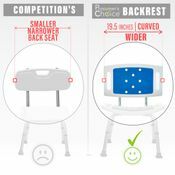 The incredible modularity means you can also use it as a compact bench, thanks to its removable padded back. Made of high-grade plastic with built-in drain holes for fast drying, the backrest is wider than typical equivalent devices so that users will feel more comfortable and secure. Ideal for parents or grandparents as well of those with injuries, your device will bring comfort and peace of mind.